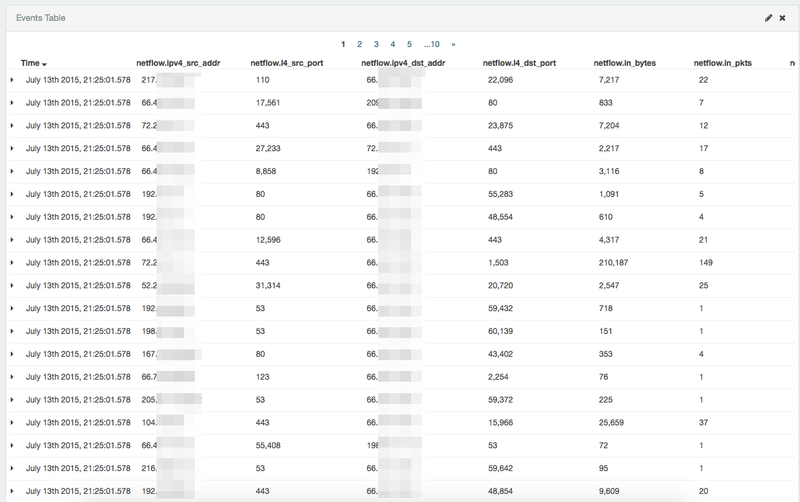 Several months ago I started working with the ELK stack (elasticsearch, logstash, kibana) for use with bluecoat proxy logs. I have been running pfsense at home for quite sometime and decided it would be nice to get some data pulled out of it, why not with netflow. As with everything else there are pieces of stuff all over the interwebs, but nothing that pulled it all together for me to use. Here is a simple breakdown of the steps. 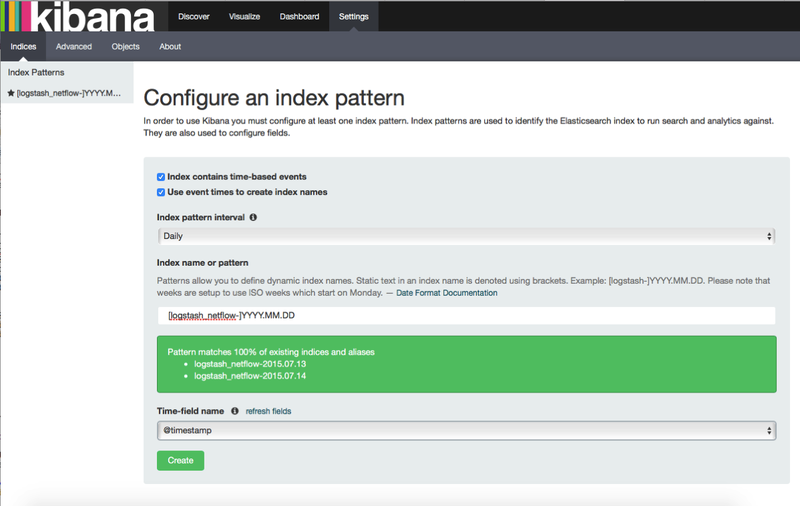 install elasticsearch – research optimizations for single node. Here is the base setup. Install softflowd package that is available for pfsense. 2. Install Elasticsearch NOTE:I just used the latest (1.6.0) as of the time of writing this. Download GPG key for apt. Add to repo list and update. Go head and install this git code that will setup kibana as a service. We will use nginx as a reverse proxy to get to the ELK instance. Kibana and Elasticsearch do not offer much in the way of security so we have to lock them to only being accessible from localhost. 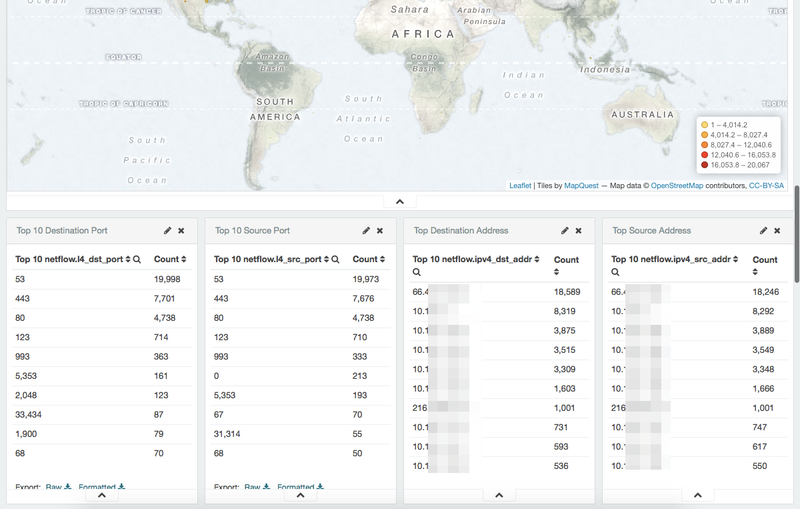 apache2-utils only necessary if htpasswd is desired to help secure the kibana instance. Replace /etc/nginx/sites-available/default with the following. 7. Configure Logstash to accept traffic and create geoid data. First get the geoip data, this is updated monthly so a cron is probably a good idea. This will create the lookup database for logstash. Create /etc/logstash/conf.d/logstash-netflow.conf place the following in the file. Parts of this are for future growth, where [host] =~ . Once we are sure that data is flowing we have to create static mappings for the geo-location data that is created by logstash. 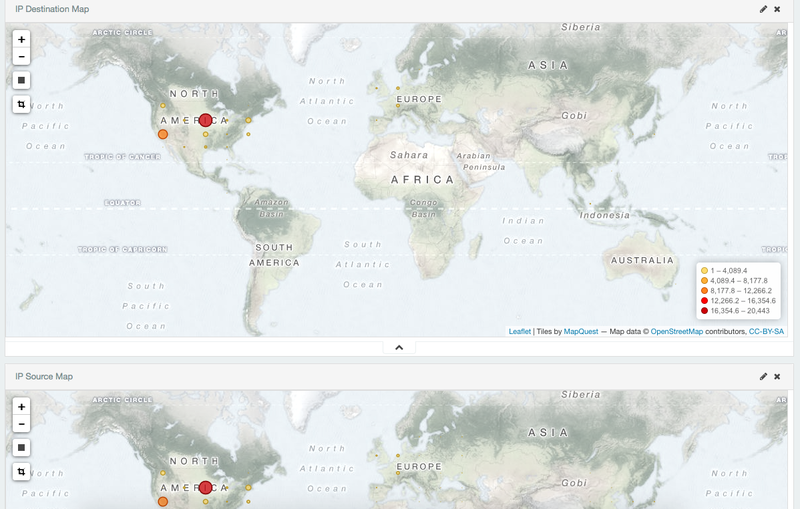 ES will do dynamic mappings but Kibana won’t see them correctly to create a map of the data. Below worked on my setup, but it took me a while to get it right. This will apply the “logstash_netflow_template” to any index named “logstash_netflow*” our index is date based (logstash_netflow-YYYY.MM.DD) so this will cover every index created going forward. 10. That should be it for configs, the rest can be done inside Kibana. 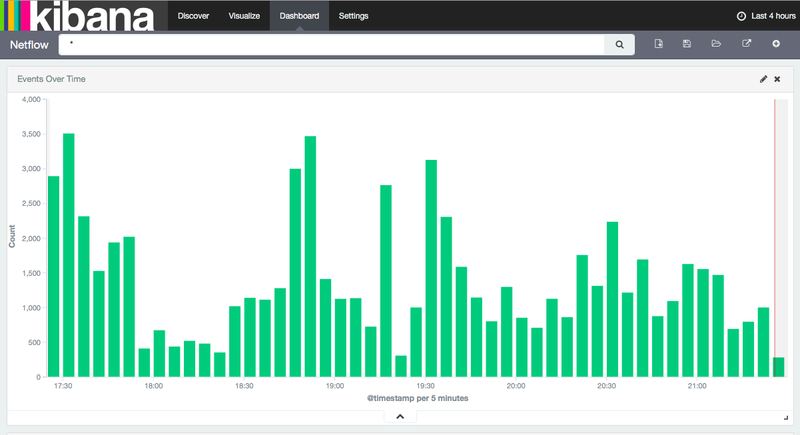 I will save the rest of the Kibana setup for another post or for the reader to struggle through, here are some shots of my dashboard as it sits using the data collected above. There are a lot of performance tuning for ELK that I will talk about in another post. This will work for a small installation. This is running at my home with average usage of about 1000 events/min. In a larger environment you will likely need to separate your collectors (logstash) from your elasticsearch instances, and tune your ES. Rule of thumb, ES_HEAP_SIZE = half of your system ram but never more than 32g. If you need more than that spin up a second instance of ES. As with most sizable organizations it is near impossible to uninstall or completely disable Java which sent us on a hunt for a feasible way to contain Java based attacks. What we came up with was restricting it to run only in trusted zones. This worked for APPLET tags when encountered in IE. This will prohibit Java from running in the “Internet Zone.” Now for internal sites you can just whitelist them as a “Trusted Zone” for java to run properly. Of course this can be done via GPO for all internal sites and if there are some identified external sites that java is required. For some fun stats, an enterprise of 15,000 endpoints went from ~1.5 take aways per day down to about 1-2 per month due to Java a java drive by style attacks. For most organizations updating java is a Herculean effort. So the whitelisting method from within Windows can be a viable alternative that can be quite effective. In recent months Oracle has released Java 1.7U40 which includes whitelisting. This is nice because it will work for browsers other than IE but odds are if you can get to 7U40 you have a good handle on patching anyway so this is less of an issue (except for 0-day). Java calls their implementation “Deployment Rule Sets” (DRS). A DRS is just a XML configuration file listing the location or hash of a jar and the action to take. You can bypass some of the pop-ups (some pop-ups can’t be disabled such as JAR unsigned), you can flat out block the jar or run the default actions as you would if DRS wasn’t defined. The XML file is parse sequentially so place your allowed jars at the top of the file and place a catch all block rule at the bottom. Deployment of the rule set is as simple as packing in a signed (from a trusted 3rd party) jar file named DeploymentRuleSet.jar and deploying to the endpoints to be controlled. Java based whitelisting is a very powerful feature but it is limited. With MSFT based whitelisting users can individually whitelist java for their own uses, but it is limited only to IE. Java based on the other hand does stop end users from whitelisting however it is a larger effort to whitelist and you either have to manage many lists for individual or groups of users or you have to whitelist sites for everyone, package and re-push. Oracle docs on the setup. All the parts to create the first project has arrived. After soldering up the pins on the cobbler kit I hooked everything up on the solder-less breadboard. After getting all that done I grabbed a quick python script to verify that my setup is actually working. Next step is to learn some python for the Pi so I can write my own scripts to progress. I picked up a Raspberry Pi several months ago after being on a waiting list. I knew eventually I would find something to do with it. To get started I am going create a simple garage door sensor. There have been many times where I pulled away from the house and couldn’t remember if I put the garage door down. The plan is to have a sensor test if the door is down and have a web page display the status of the door. Eventually I want to expand it to actually lower or raise the door (Still planning that). I will be updating here with the project. Everything is on order, once it arrives the project really begins. Pi is loaded with Rasbian and on the network.